As a teenager I never had a Saturday job or a paper round. Instead, my extra pocket money came from playing at weddings. Most of the time I was playing in a quartet, which obviously has its own challenges (I’ll probably end up writing about this in the future), but it is fairly easy to put some pieces together into a set. Last Saturday, however, I did something totally different. Not only was the wedding on a barge, the music was for solo violin and solo trumpet with backing tracks and the reception was a surprise for the bride! Needless to say, the fact the groom could only phone secretly and at certain times made the organisation of everything more difficult than usual. When I looked through my collection of music, I found I only had two books that included CDs with backing tracks. One of these was a volume of Disney songs, and the other was from Lord of the Rings. Music from Middle Earth didn’t seem appropriate for a wedding, so it looked like Disney or nothing. Luckily for me, one of my friends had some books with classic pop songs, (Reach, It’s Raining Men etc. All the classics!). I borrowed these and with some old ABRSM Grade books with CD accompaniment I managed to create two 40 minute sets. 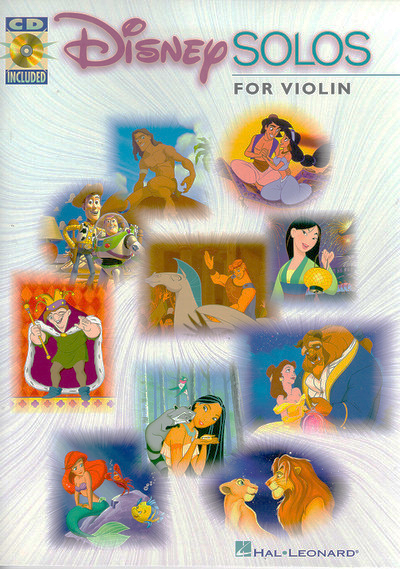 The Disney songbook that the kids loved so much! The day of the wedding went mostly to plan. The barge had loads of space for us to play, my trumpeter friend Ella and I alternated sets, ate some lovely food, and had children dancing to the Disney. Then the groom came over and requested that we did a duet. Problem! We each had our own music, and the trumpet is a transposing instrument. This meant that what the Ella was reading on the page sounded in a different key when I played it – and the same in reverse if she played from my music. So we picked a few pieces that both of us knew and I improvised an accompaniment by ear while she played the tune. This went surprisingly well, and it was lovely to see the bride and groom dance to our rendition of ‘She’s the one’. All in all, a great day. Challenging in the run up and a bit scary, but both of us loved it. We are now thinking of advertising as a duo to do similar events – but we will be practicing our duets first! Hello and welcome to my first post. To sum me up: I’m a music student in London, I’m Welsh and I play the violin. When I was four years old I first heard a violin played and decided that I wanted to learn – and despite a phase when I hoped I would get a letter from Hogwarts and become a wizard – it is all I have ever wanted to do. The music I study is mainly classical but I enjoy listening and playing a variety of styles including folk, jazz, …. and even Abba. In this blog I would like to share some of the music I am listening to and hopefully introduce you to something new. I also want to relate the pieces to the places music has taken me. My next post will involve a wedding on a barge and an unexpected playing of Beauty and the Beast! However before that I thought I’d share a couple of blogs I like : one musical, the other about a hobby of mine – baking! The soprano Jennifer Rivera writes one of my favourite musical blogs. (http://jenniferrivera.squarespace.com/blog/month/july-2013) She is funny and shows another side to the opera world, making it feel more accessible to the non-musician. Her blog looks great and has introduced me to new operas. Since becoming a student I have begun to enjoy baking and have always liked cake eating! I have discovered Edd Kimber’s blog, the winner of the first series of the Great British Bake-off (http://theboywhobakes.co.uk ) . He regularly posts lots of different types of recipes (mainly baking) and there are all sorts of interesting ideas. His recipes are very easy to follow with video how-to’s and lots of images of the various stages. I’m looking forward to trying out some more of his recipes, or persuade my brother to make them for me!